New desk space | My go-to spot right now. 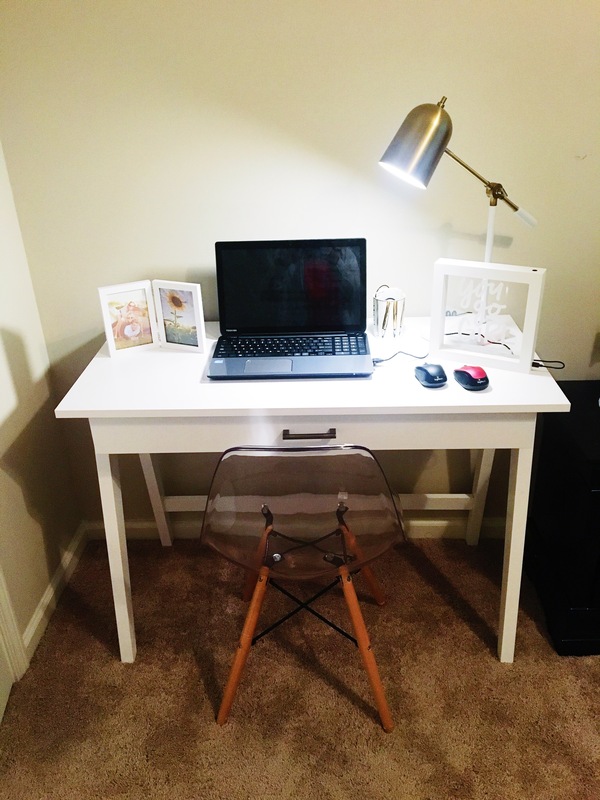 Who would have thought a desk with a computer and some cute decor would make such a difference?! My PC isn’t even a MAC BOOK he-he and I’m loving this new space in my room. Is anyone else on this bandwagon of wanting a MAC so badly ?? lol. anyways I get so excited to go home and just be in this environment. I wanted to share this with you because I’m almost positive this costed less than you would think! I bought it all in one day too! I also included a before and after of the “floating shelf look” These are so POPULAR right now and I now understand why. They add such awesome character to the look. What’s on my desk? I am a very simple girl. I love the simplicity of a desk, a computer, and a few accessories. I have had my laptop for a while (due for a new desktop one) maybe one day.. but this one will do for now of course. A giraffe made out of different colorful cloth( I can’t remember where I got this I think it was a gift), but I LOVE giraffes so this particular one will always be visible somewhere! A Kate Spade pencil holder it was on sale and it’s so girly and cute. My planner I got from amazon that I try to use but I don’t know if I’m a planner type of girl. I’ll jot down birthdays and goals mainly. This antique led light it adds a different look so this will always be a staple on my desk and normally I’m not blogging until I’m off work or on days off. Some pictures to keep me motivated. I loved the “you go girl” phrase and it makes me smile so yeah. Below I’m going to link where I got everything. What do you think about this space? It’s perfect for all you bloggers if you haven’t bought these kind of things yet! I can sit there for hours just reading blogs and writing ❤ ❤ I’m still going to add more probably! World Market- Chair (again this was on sale for $50.00) I love the clear look!! All together it was about $180.00. not bad at all! Thanks so much! Let me see when you are all done! You go girl! Having an organized space definitely helps ideas and energy flow better. This is inspiring me to clean up my desk space. If I don’t procrastinate. I have a desk with a bunch of books piled on top of it and two laptops just laying on my bed. I really need to reorganize everything. Staying organized is the hardest part, but just give yourself that pep talk! You got it! Thank you for reading! Thank you! Simple is always better for me! I love this chair. It’s pretty comfortable to sit in also. I didn’t want the basic computer chair so I went with something different lol. Thank you for reading! I’m jealous of your space right now. It looks nice and I need one too. Thanks for sharing where you got everything. thanks so much for stopping by! I will check out your blog too! Thank you so much Pamela. Go back and get it lol it’s online for like 50 $ but in store it is 14$ great steal! Awe, thanks so much!!! I will definitely follow back. This is an awesome space! I really love this. The kids have taken over at our house, I really need a workspace of my own. 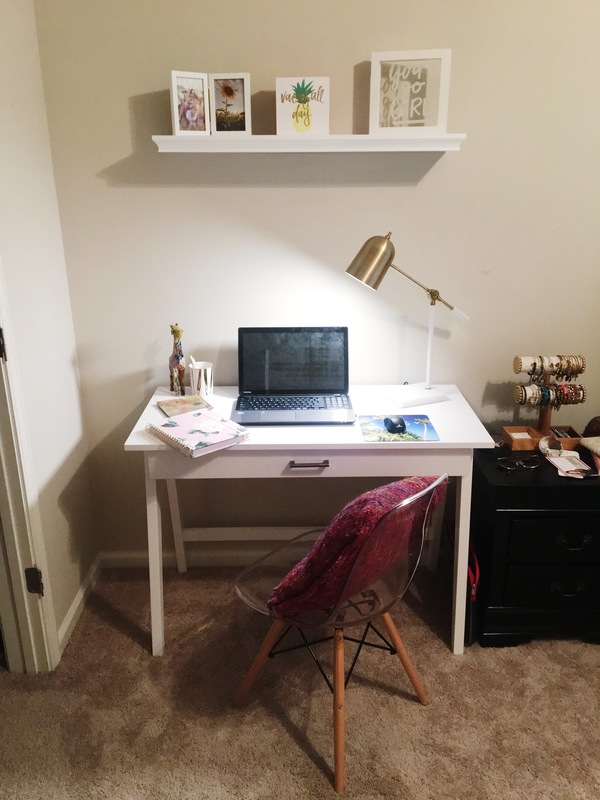 Your desk space is too cute. I love all the white and that Lamp!! Oh my gosh thank you! ❤ means so much coming from you. I love the floating shelf! Haha, yeah no arguments there!!!! Looks cute . Love it. I love your little desk and surroundings! I would love to have a desk instead of sitting at my dining table: I feel like sitting at a desk would put me in work mode easier! Don’t have the room, though :(. It is awesome but I’m not going to lie I use my phone more then anything 😂 it’s still a nice area but I don’t use it as much as I thought.